and use it with the below rack.xml. The <cols> tag is given in HP. The above rack.xml is for the 12U 104HP gorillabox. i got some zips from the module maker database and they all appear with gray faceplates and of the exact same width when i import them into the rack planner. any ideas what i can do to fix this? Maybe you didn't put those zips where RackPlanner expects to find them. There's some talk about this in the readme. The XML file defining the rack has a line saying where the modules are. In the same folder as my RackPlanner.jar is a folder named modcanA and that's where the zip files are. Other formats are in other folders next to that one, such as Euro, Frac, etc. Where do I find all the images? There are a few folders of images, but not a whole lot. When clicked on one of xml files my East West VST opened???! You can also get them from John Noble's eurorackdb.com. Save the module zips intact into the appropriate subdirectory of the RackPlanner directory (don't unzip them). Have a look in the euro subdirectory to see what I mean. Don't double click on the XML files. Double click on the jar file. Then use the file menu to open and save racks. Hi folks, I just released v1.3. You can now select multiple modules in the Add Module dialog. i actually already had it open today and gonna DL the new version asap! Nice feature update, thanks dougcl. FYI there are Serge files in the library now. Maybe a dumb question... But iOS version on any horizon? I'd certainly pay for the pleasure. Some more experienced developers may correct me if I'm wrong but I think Java app are not allowed on iOS so I guess porting Rackplanner to iOS is far from straightforward to say the least. The Apple control freak trait makes it very unlikely. iOS is a closed proprietary system requiring the developer to pay a yearly subscription ($$) and be at the mercy of Apple's centralized approval process for apps. Remember, they decide for you. It's not a technical problem. Apple legally forbids it. Something about "no applications that can host other applications." This is exactly what the Java JVM is. I've gotten well into an Android port, but now I'm wondering if that was a good decision. They really hosed up the Android implementation of Java. There are whole new (unnecessary) class hierarchies that basically mean the code is completely different. The idea of using the JVM to support portable code was lost. I think the answer is an online planner based on the module standard that RackPlanner established. I'm in the midst of a big overhaul to ModuleLibrary and keeping an open mind about following up with a web based planner. In many ways I prefer the possibilities provided by the application + files approach of Doug's RackPlanner or Richy's work in progress but for certain situations, including closed platforms, a web app would be good. It would lean heavily on jQuery and an API to the new library. I dunno anything about technical stuffs... I'd still pay for it if it ever happens. Somehow in the move to version 2 I designed away important information like, where the heck does one get the RackPlanner application. So that's all right on the front page now. The clump of thumbnails of recently added modules is now wired up like the search results are. Mouse over thumbnail to see full size image, click thumbnail for module details and download button. Is it possible to add single Serge modules to the rack planner? Yeah I think so. 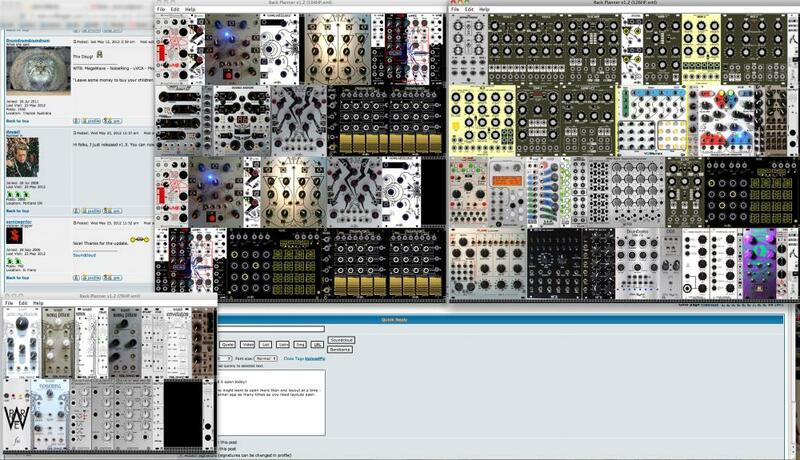 All the modules are up on squiggletronics. Let me know if you need help. Somebody was asking elsewhere about individual Serge modules (not panels). I guess they want to recreate custom panels they already have. I could do that if somebody wants to cut up the images and give them filenames like the module names (to be used as Model in RackPlanner zip). PM me for details. I see. looks like the obelisk is already there as a 1HP single module. So yeah, just need jpgs to make modules in module builder and submit them to the library.